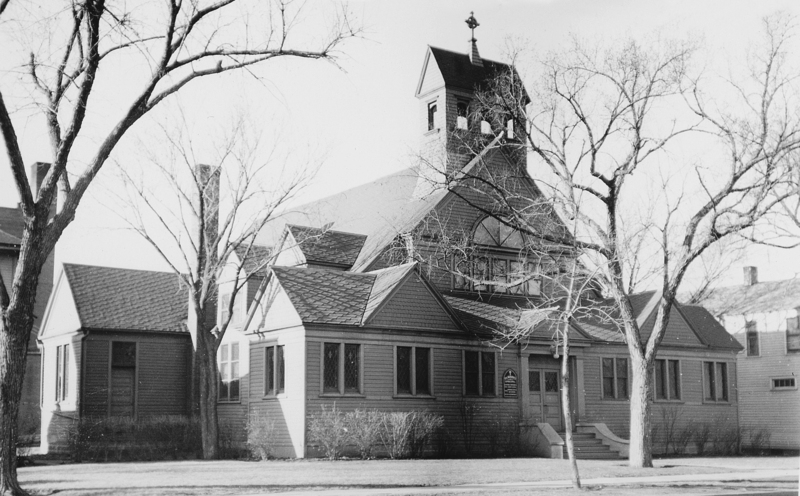 The last church to be highlighted from our collection is the St. Mark’s Episcopal Church. This one was built in 1887, a little bit later than some of the others covered in the blog, and it was built in the early English style with a cruciform shape. It had an open truss work roof, and inside there was an altar of carved oak and pews of oak with walnut trim that were provided by the Young Ladies Guild. Among other interior décor were a brass chandelier, a lovely bishop’s chair, and a bell that were also generous contributions from community members. When all was said and done, the church cost almost $7,000 and all was paid except for a $1,000 loan. The new church that was built cost an estimated $147,000, and this time it was much more fireproof with a rock-stone exterior and a brick interior. This time luck must have been on their side, and the church continues to function to this day. In fact, it can still be located at 1410 North Kline should anyone desire to visit.